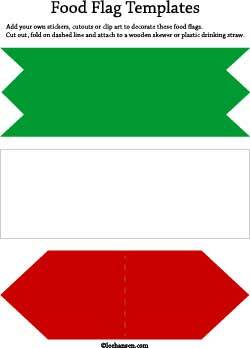 Holiday Colors Mini Flags for Cupcakes or Sandwiches- These cheerful red, white and green food flags can label your holiday buffet table foods for your party guest tables or decorate windows, doorways and walls. Simple print, cut and glue, 3 different flags on each sheet (see illustration below). Instructions for making simple mini flags are included on each printable sheet. Make food flags, party favors or table flags with your mini flags. Make a festive Party Banner with printable mini flags! The colors on these cupcake flags/food flags are just right for Italian Festivals, too! These holiday-ready flag craft sheets feature 3 unique shapes in Christmas colors of red, white and green. Print and assemble your food flags to label your party dishes and pot luck goodies or to make a festive party swag banner. If you're planning an Italian festival, these mini flags are also the best colors to use for your party banners and food flags! Printable flag sheets on 8.5" x 11" letter paper or card stock in Adobe PDF format.